We're still not sure if the LG G Flex will make it to the UK, US or Australia, but we now know that it will hit French shores next month after launching in Korea. So the signs are good for a possible December release - although it's not good news for your bank account, with the LG G Flex pricing revealed to be 999,900 Korean Won which is about $940 in the US, £583 in the UK and AU$992. 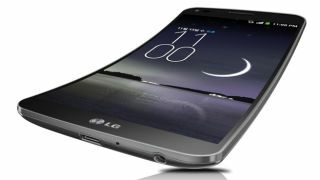 Its curved OLED ways will hit South Korea on November 12, with 2GB of RAM, a 13MP camera and a Wolverine style scratch-healing coating on the back of the device. But the headline feature is that curved, slightly bendable screen which, it has been confirmed, does actually flex. Flexible phones look set to be the next big tech thing, with Samsung's Galaxy Round also doing the, er, rounds and rumours of bendy batteries starting to proliferate.